This is a very easy to make potato salad nicoise recipe. A “nicoise” salad contains potatoes, but is far from the usual potato salad. Traditionally a nicoise salad calls for green beans and tuna. We have kept the green beans but have substituted the canned tuna for lovely fresh salmon. I think you will enjoy it. It makes a wonderful lunch or a light and easy dinner recipe. Cook potatoes until tender. Drain and rinse under cold water. Slip skins off and slice. Cook green beans under just tender crisp. 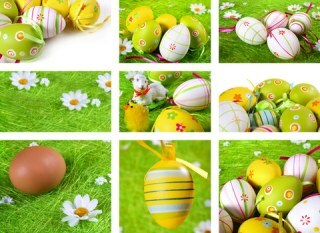 Drain and immediately rinse them in cold water to retain their color. In a large bowl, stir together mayonnaise, onion, lemon juice, mustard, garlic salt and pepper, Add the potatoes, green beans and tuna. Toss, breaking up tuna into chunks, until mixture is evenly coated. Cover and refrigerate. To serve, mound salad on lettuce-lined plate and garnish with eggs, olives and tomato wedges. Our version of this French recipe uses a mayonnaise based salad dressing. You will often also see nicoise salad dressed with a vinaigrette dressing. Both are good. The addition of hard boiled eggs, tomatoes and olives makes this a hearty salad, perfect for lunch or a light dinner, served with warm with crusty rolls and a great dessert. This is a very healthy salad recipe, a real meal in a bowl. That is why I have included it in our list of diabetic recipes. However, for those on a diabetes diet, I would only use about half of the amount of potatoes called for in the recipe. Or try it with our light fluffy buttermilk biscuits. 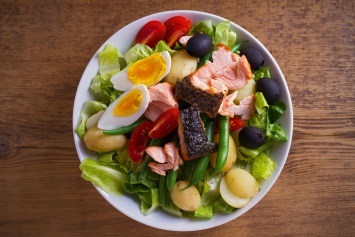 Our salad nicoise recipe is just one of our wonderful salad recipes. Find them all here.